Japanese Episode BW 007: "Get and Attract Tsutarja!?" American Episode 1407: "Snivy Plays Hard to Catch!" While stopping on the road for a quick meal, Satoshi and his friends have their food stolen by a wild Tsutarja! Satoshi decides to capture it, but his first attempt fails when the female Tsutarja uses Attract to daze Pikachu and make it unable to battle! When Tsutarja continues the battle by using Vine Whip, Satoshi jumps between the two in order to shield his pokemon from the attack. Impressed with Satoshi's selflessness, Tsutarja stops its attack and retreats. Satoshi, not wanting to give up, sends out his Mamepato to track the pokemon down. 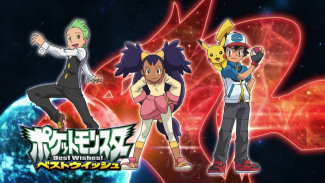 Meanwhile, the Rocket trio receives orders from Sakaki to be on the lookout for the rival organization that's also operating in the Isshu Region. Later, Satoshi finds Tsutarja again and attacks with Mijumaru. 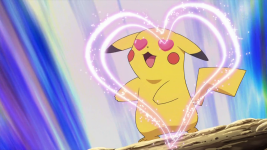 Mijumaru, like Pikachu, is also a male and therefore succumbs to Tsutarja's Attract very easily. This pattern of tracking Tsutarja down, getting defeated by Attract, and then trying again continues until the Grass-Type pokemon is finally chased down to a river. There, Satoshi calls on Mamepato since it's the only one of his pokemon not to be defeated by Tsutarja's Attract. Luckily for Satoshi, his Mamepato is a female just like Tsutarja and is therefore immune to its attack! A few Quick Attacks and an Air Cutter later, Tsutarja is weak enough for Satoshi to capture it in a Monster Ball! Now that he's finally gotten the Tsutarja he's been after, Satoshi continues on the path to Shippou City. Oh my God is this episode a chore to sit though. The other Pocket Monsters series have done plenty of episodes centered entirely around capturing a pokemon and I usually find those to be pretty boring as well, but they at least tend to have something going for them to make the 22 minutes not drag on so much. Like "Fukamaru! I Got One!! ", from the end-ish of Diamond & Pearl. Jun's antics and the great animation pretty much saved what would have been an otherwise terrible episode, but unfortunately the same can't be said for this episode of Best Wishes! Everyone else seems to like this one because it reveals the genders of all of Satoshi's pokemon, but I don't really care about that one way or the other so this means nothing to me. What does it really matter, at the end of the day? Do any of us really get anything out of the confirmation that, say, Mijumaru is a boy other than being able to boast that SEE, I TOLD YOU THERE'S NO WAY MIJUMARU COULD BE A GIRL, IT WAS SOOOOOO OBVIOUS!!!! I mean, I will at least give the TV series props for taking a more "realistic" approach to the whole gender thing by forcing its characters to figure this sort of thing out on their own, especially since they can't exactly take a peek over their pokemon's HP bar to find out like you and I can in the games. And I especially like how Satoshi didn't know his Mamepato's gender since real world bird genders are pretty difficult for a trained adult to figure out, much less a hyperactive ten year old. But, again, pokemon genders don't matter to me, so the revelation that Satoshi's pig is a boy is meaningless. So what carries this episode then? Satoshi's determination to not give up, and his ability to win over the trust of pokemon by showing us how awesome his friendship with Pikachu is? Not really, because we've seen this sort of thing a million times before by now. New pokemon? No, because this is the first episode of Best Wishes! to not debut any new species. Like I said, this episode is a chore to get through. Let's see...what else? This episode shows us that Dent's a good cook and has the same reality-bending TARDIS backpack that his predecessor had (haha, remember me talking about "realism" earlier? ), but I always kind of write those things off because this is the same series that has characters carrying around giant monsters in capsules the size of baseballs. Is a full kitchen set crammed into a backpack really any different from, say, Takeshi having a nearly 500 pound snake in his pocket? (And yes, that innuendo was intentional). And speaking of snakes, I would like to point out that, as of this writing, Tsutarja has exactly the same moveset that it has here in its debut episode. A starter pokemon going more than two years without learning a single new move is actually pretty terrible, y'know? Finally, I think it's pretty funny how Kojirou's all like "we have to catch more pokemon to build up our army" and then doesn't bother trying to catch anything else for the next fifteen episodes or so. So much for that! The script for the English version of this episode is actually really good. Yeah, there are a few lines here and there that are worded awkwardly and the acting isn't always the greatest, but as far as flat-out rewrites go there's very little to talk about with this one. It's also kind of weird that the English version of the episode that sort of kicks off the whole Meteonite plotline aired so soon after the disasters that caused its conclusion to be retconned out of the series. 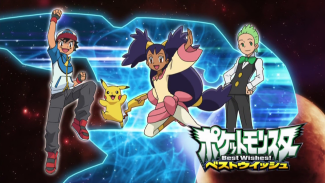 There's nothing either party could have done about this, of course, but it's still weird to go into this episode with the knowledge that we're not going to see the payoff to all of this sneaking around the Rocket trio's going to be doing for the next dozen episodes or so. So in this episode of Pocket Monsters Best Wishes!, a snake (Tsutarja) uses Mero-Mero to make its opponents fall in love. Those of you who also follow One Piece will almost certainly know about Boa Hancock, a snake princess who uses Mero-Mero to make her opponents fall in love. So what's going on here? In Japan (and other Asian countries), snakes are seen as representing love and virility. If you look up anything to do with Chinese zodiacs (which Japan then based their zodiacs on), you'll see that love almost always comes up when talking about snakes. This is quite different from the West, where we tend to see snakes as representing temptation and deceit because of the story of Adam and Eve. 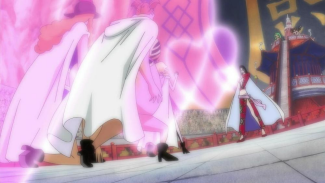 It's also entirely possible that the producers of the TV series are just One Piece fans and wanted to pay tribute to Boa Hancock in some way. The character debuted in the One Piece TV series in July 2009 and showed up even earlier than that in the manga, so she had been around a good while by the time work on this episode of Best Wishes! would have started. It's also entirely possible they were going for the whole Medusa thing with both Boa Hancock and Satoshi's Tsutarja. That connection is more obvious with Boa Hancock than it is Tsutarja, though, but it's still a possibility. Iris: "Only a kid would make such a big deal out of this." "...make such a big deal out of this?" He only said "yummy" one time, Iris. How is that a "big deal?" Originally, Satoshi keeps saying umai (うまい), or "yummy," over and over, even when he's chewing. Ash doesn't, making Iris' line seem a little weird. Also, do I even need to to bother mentioning Jessie's "Who's That Pokémon?" from later in the episode? This "let's have random characters say the eyecatch phrase, for no reason at all!" thing has been happening a lot lately, so I'm not going to bother bringing it up anymore. If you hear the phrase "Who's That Pokémon?" from now on, assume that that's not what they actually said in the Japanese version. Dent is added to the eyecatch as of this episode. This will be the last time the eyecatch gets updated until the second half of "Season 1."